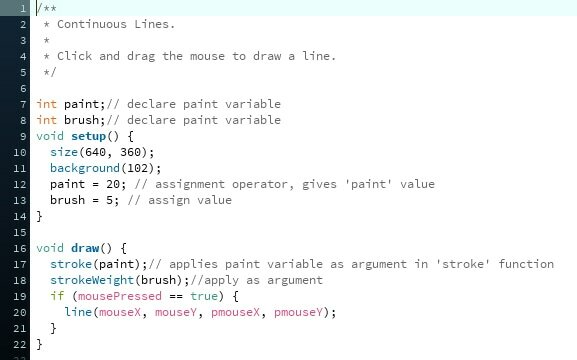 Overall creative coding was really insightful, yet difficult! I think I'd need many more sessions before I felt confident enough to explore it further within my own work however I was able to extend the DADA workshop task using ideas we'd explored in sessions. I also explored the use of code in the Vertical Project where I used Trapcode Form, a coded plug-in whereby changing the values changes the outcome. In the future I'd like to further explore the function which utilises the movement of the mouse such that the viewer of an image could move the mouse to change elements within and is thus in control of the image's outcome. With this and the knowledge from last week, we adapted the 'walking line' example from the first session using classes. We used the two tab system which provides other classes access to the fields and methods within a class. The public keyword is used before a field or method that you want to make available. Working in this way allows for instances to be applied to more than one than one element such as the constructor and the variables. 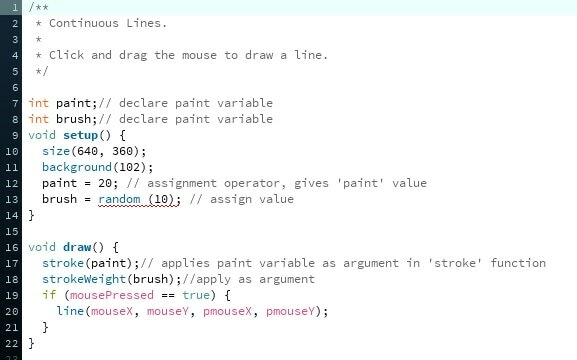 With this in mind we created a number of declarations to which we applied the same functions through the class. As an extension task from the DADA workshop, I began utilising what I'd learnt in the creative coding sessions. The DADA task focussed mainly on the uncontrolled nature of poem construction. 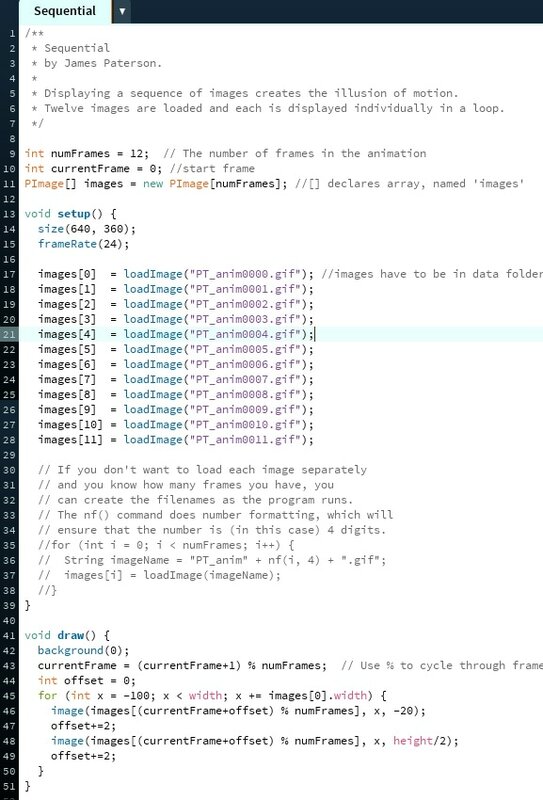 I therefore used Processing to code an experience whereby you click the screen and a randomised selection from the text excerpts appears and flicks through the rest frame by frame in a random order. The overall effect feels very DADA-esque. This shows how to create an object of type 'derek'. At first it seemed nonsense but all became clear when working through it. We used a two tab system which provides other classes access to the fields and methods within a class. The public keyword is used before a field or method that you want to make available. Working in this way allows for instances to be applied to more than one than one element such as the constructor and the variables. With this we created a GIF of sorts where an image is called up every time the mouse is pressed. We applied transparencies, colour and more through the class. - Public: used to provide other classes access the fields and methods within a class. The public keyword is used before a field or method that you want to make available. In Processing, all fields and methods are public unless otherwise specified by the private keyword. Before today's session was underway, we discussed last week's homework. I'd managed to randomise everything but the colour. After some guidance from Jeremy, I was successful in doing so. I also moved the randomise functions from setup to draw which meant they randomised on each frame rather than each time the animation was opened and closed. In the first example below, I accidentally declared the background after the text command which meant a scrolling number appeared. This essentially masked the text command meaning it didn't appear. The number tracks the x coordinate as the mouse is moved. I rectified this in the second gif however the scrolling number still appears for some reason. We next tested movies. This is declared as below and works in a similar way to calling up images with the movie in the necessary directory. The looping function causes the video to repeat onces it completed. Finally we imported a gif as frames attached to a cursor. This test allowed me to fix the animation I was working on during the break of the floating body which appeared too far away from the cursor. It turned out the image wasn't cropped or centered as we learnt in the Muybridge example. In addition to the codes above, we explored a few preset codes with Processing. These are located via the example tab as follows: Examples – Libraries – Video- Capture. These functions use the webcam. I was particularly intrested by the brightness tracker which tracks brightest part of image using a coloured circle. This can be altered in the code. If "image(video, 0, 0, width, height);" is ommited, the webcam is closed yet the circle still tracks the brightest pixel. Time displacements was also interesting and could be used when developing the group manifesto project since this focuses on glitchy, warpy imagery. Also, my current idea for the Text and Context project requires imagery for hallucinations which could utilise the time displacement function. This can also be done in After Effects. See animation below for an example. Time remap - Anamorphose temporelle from Adrien M & Claire B on Vimeo. ​//using random values, how much variation can you put into this simple sketch? I'm still not really sure what I'm doing when it comes to processing so I often take a trial and error approach before asking for help or conducting research online. In this instance it sort of worked. I referred back to the introductions we were taught in the previous session and they gave me a rough idea of the syntax and how to avoid errors. Since the task was to use random values, I began by changing assigned values to the random function. In the examples below, I changed the variables to floats in order to correctly use the random function though I later realised I could have simply put (int) before random for the same effect. Again I'm not too sure how extended the variation task is though I have managed to randomise the widths on the line and its x position however the random function I placed for lineColour didn't seem to work. After the first session I was a bit concerned that Creative Coding wouldn't be for me as I couldn't see how it fit into my practice. I therefore conducted some research when I got home to understand how others have been able to utilise the process within illustrative works. Moving Moon from Nancy Liang on Vimeo. I really love Nancy's work since she is able to combine a number of processes from collage to illustration and processing itself. She manages to subtly animate a narrative, all controlled by the cursor of the user. I'd really love to explore this within my work through the concept of control and how the user is able to control and adapt the setting by having elements of the illustration react to their cursor. As a test, since I'd never coded in processing before, I began trying to figure out how to animate an existing piece of my work through the cursor. Below shows how I was able to connect the hovering body to the cursor so it appears to rise from the burning house. I haven't yet figured out how to constrict this to only the width of the house and avoid it moving along the X axis. The cursor also needs to be quite a distance away from the body for it to be in the right place which also needs rectifying. The aims of the Creative Coding module is for it to inform my personal practice. Below are the notes I took during the first session.